From 26th August to 2nd September 2016, Tony and Geoffrey visited Rondon Ridge Lodge in Papua New Guinea. The lodge is situated about 2200 m.asl and has breathtaking views over the Wahgi Valley and Mt Hagen. The staff and locals in the area were extremely friendly, and the quality of the lodging & food outstanding, especially considering the remote location. 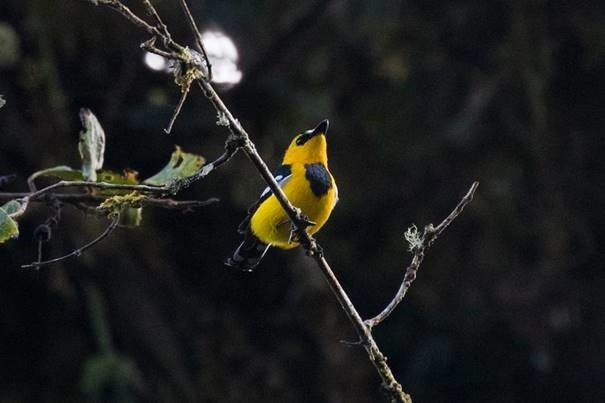 There are many trails close to the lodge and a map of these (along with a bird checklist) is provided upon arrival. Remarkably the area boasts over 130 species (of which we actually saw 81). Additionally there is a main trail to the summit that will require a guide. This trail can be quite a tough climb with gear but is so worth the effort; it takes about an hour and half to reach the main summit clearing and another half hour to reach the actual summit. 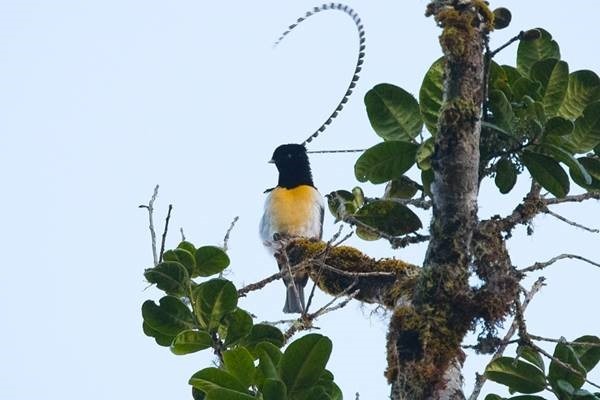 The summit clearing is an area that has a few trees cleared and is particularly good for Sicklebills and the King-of-Saxony Bird-of-Paradise. The weather here is consistent and for the most part pleasant throughout the year. Mostly clear in the mornings with fog to be expected at higher altitudes with clouds building up during the afternoons for possible showers late in the day, normally between 4pm and 6pm. Temperatures are cool in the mornings but for the most part very pleasant. Trails are normally muddy so water proof boots were used throughout. Mosquitos although present were not a major problem and malaria is not present at this altitude we saw only one leech and thankfully did not experience any issues with chiggers. 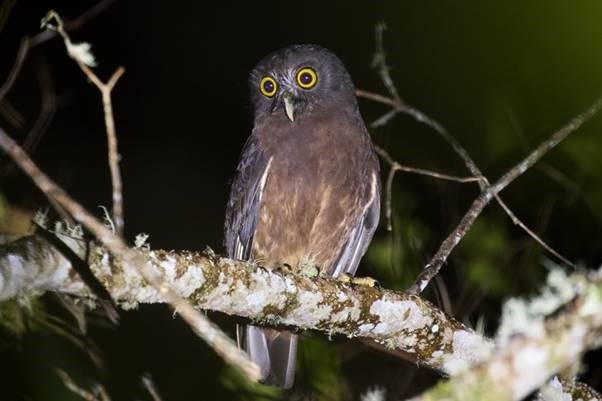 As is often the case in Papua New Guinea bird density was low and for the most part birds are very wary. 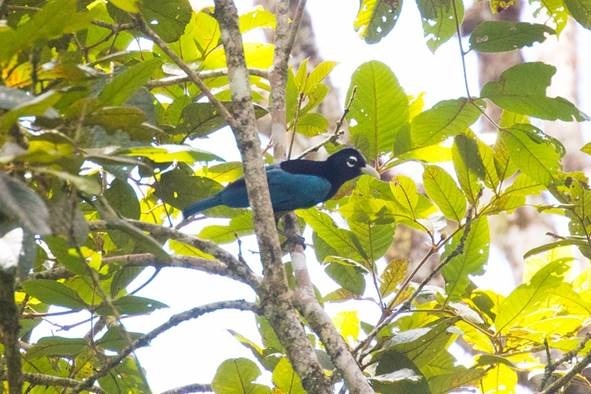 Nevertheless, birding here is an experience never to be forgotten especially for those interested in seeing the birds of paradise in their natural habitat. In addition to birds, the lodge also offers cultural tours into Mt Hagen and has a wide selection of New Guinea artefacts for sale. Below are some notes about a few of the key species we encountered. Quite common in the area, but difficult to observe well. We saw one from a hide at one of the active bowers about half way up the main summit trail and a few incidental sightings elsewhere. Best areas seemed to be the upper sections. The local guide knew the locality of many of the bowers that were off the main trails. Some of the older bowers had been disturbed by locals and the hide that we visited was in need of repair. Rondon Ridge is a key site for this difficult species that has now been placed into its own family. We heard them daily in areas about half way up the summit trail and in forest surrounding the summit clearing. We saw birds briefly without playback twice by simply looking carefully for birds that were calling. Three more were attracted to playback but proved very difficult to observe well. In total 4 birds were seen. Most were in the understory although; at one spot they were chasing each other more towards the canopy. At this time of year (we suspect after breeding) they were not calling often and were not responding well to playback. This could be that the call we had appeared to be of a different dialect as it had more notes to it. In each case the birds appeared to favour the more densely vegetated gullies within the forest. The call is conspicuous and is the best way of determining their presence. This species is a Rondon Ridge speciality (such a magnificent bird). The summit clearing is main site. It is necessary to be there at dawn or at least early morning. Birds were calling (what a sound) from dawn to about 8.30am. They are a little shyer than the Brown Sicklebill which is at the same site. We only had brief views as it was calling from a difficult spot. Once you are at the clearing one cannot miss hearing the bird. Another key species that is now in its own family. Heard a lot more than seen and quite common throughout the bamboo areas particularly at higher altitudes around the summit clearing. Two males were seen along with 3-4 female and juvenile birds. Best located by call near areas of climbing bamboo in the upper forest areas. The call is very similar to that of Black-throated Robin. Common in forested areas between the lodge and the summit clearing but difficult to observe at close range. The guide new the main display areas and of course finding a suitable fruiting tree a key technique for seeing these birds. Once again the summit clearing is the main site at Rondon Ridge. At least two males were active each morning that we visited. Another speciality of Rondon Ridge. Best approach is to identify the call which is loud and conspicuous. Our guide Joseph certainly new the best spots and led us to a display tree where the bird was calling. It was then just a matter of waiting for the bird to show itself. This species prefers the forest at lower altitudes.